The 65th anniversary of the liberation of Auschwitz-Birkenau concentration camp is being marked at events across the UK on Holocaust Memorial Day, January 27th. As part of a programme of events in Brighton and Hove, the Jubilee Library is hosting and exhibition entitled ‘Portraits for Posterity’. ‘Portraits for Posterity’ is an independent project begun in 2007 which aims to make a national collection of portraits of Holocaust survivors now living in Britain. Each portrait is accompanied by a short biography of the subject’s life. It is hoped that the collection will provide a valuable educational and community resource that will be available for future generations. 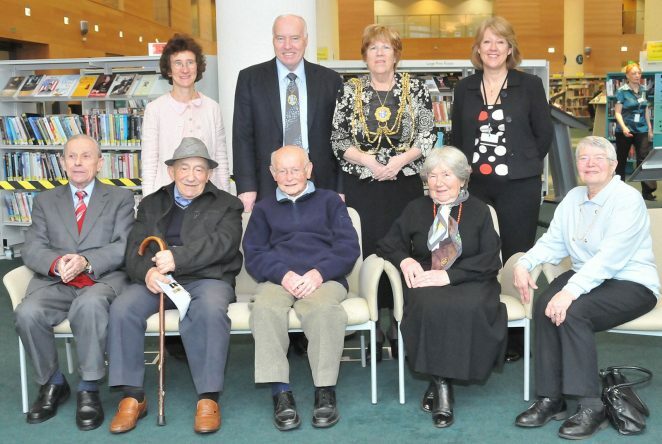 The Jubilee Library exhibition, which features local Holocaust survivors, is open until Saturday 13th February. For more information contact the Jubilee Library: 01273 291280. The Mayor of Brighton and Hove, Councillor Ann Norman, with her Consort Councillor Ken Norman, met with some of the participants in the 'Portraits for Posterity' Holocaust project. More information about the project is available from http://www.portraitsforposterity.com. Jacki Reason (photo, top left) Project manager, Portraits for Posterity.